A grand floral set-up, multi-cuisine menu, old Bollywood melodies and an ever-smiling couple. Newly wed actors Deepika Padukone and Ranveer Singh's exuded charm and joy as they personally greeted over a thousand guests at a reception party here. 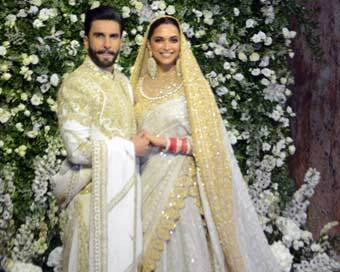 Dressed in ornate white and gold designer ensembles and flanked by their parents and siblings, the couple stood tirelessly for close to five hours meeting and greeting their approximately 1,200 guests, which primarily included Ranveer's family and media persons here on Wednesday night. The couple arrived at around 8.30 p.m., and posed for the shutterbugs against a backdrop done up with green foliage and white flowers. They proceeded to the hall at the Grand Hyatt hotel. 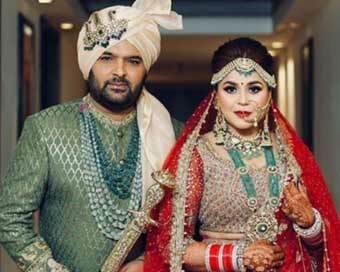 As guests looked mesmerised inside the hotel, outside was a steady stream of fans hoping to catch a glimpse of either the star couple or a Bollywood face.